Redline's vision is to create world-class coffee products that are infused with vintage car design. Two seemingly unrelated things, but we see both as fuel for the high revving soul. The MK1 Coffee Brewer was designed with this philosophy in mind. The MK1 brews a great pot of coffee. Its powerful heating element allows it to reach optimum brew temperatures between 195-205 degrees Fahrenheit and can complete the full brew cycle in 6 minutes. The brewer includes a "pre-infusion" mode to allow for your coffee to bloom. Blooming allows your beans to de-gas, creating more space for hot water to really get in there and extract more flavor. There are no complicated screens or menu buttons. The MK1 has a single switch and a single drip lever. It is simply a pleasure to use. Wide-open water reservoir for spill-free pouring. Slide-out filter basket for easy loading and cleaning. The "Parking Brake" drip lever allows you to open or "pause" your brew and even fine tune the rate of your drip. High boron glass carafe with insulated funnel for even distribution of fresh coffee throughout your pot for a consistent taste from start to finish. Premium brews. Elegant design. Accessible price. If these are things you have been looking for in a coffee brewer, simply click "ADD TO CART" today! TAKE YOUR COFFEE BREWING EXPERIENCE TO THE LIMIT: The Redline MK1 is a premium quality coffee brewer available at an accessible price. Enjoy your favorite coffee to the limit by brewing with the Redline MK1 8 Cup Brewer. OPTIMUM BREWING TEMPERATURES FOR OPTIMAL EXTRACTION: Create a pot of perfection every time. The MK1 reaches optimum brew temperatures of 195-205 degrees Fahrenheit It will also brew a full pot in under 6 minutes. BREWING MADE EASY: With a press of a switch, you are on your way to make consistently great coffee. The MK1 also includes a pre-infusion mode which your coffee to "bloom". Blooming allows the gasses in the coffee to be released, resulting in optimal extraction from your grinds. This can all be achieved with the press of a single switch. ELEGANT DESIGN: All of the MK1's features are simple, mechanical and thoughtfully considered. The wide-mouth water reservoir is designed for easy pouring. A simple drip lever we nicknamed "The Parking Brake" allows you to "pause" the drip during the middle of your brew for those times you need to get to your coffee ASAP without worrying about making a mess. 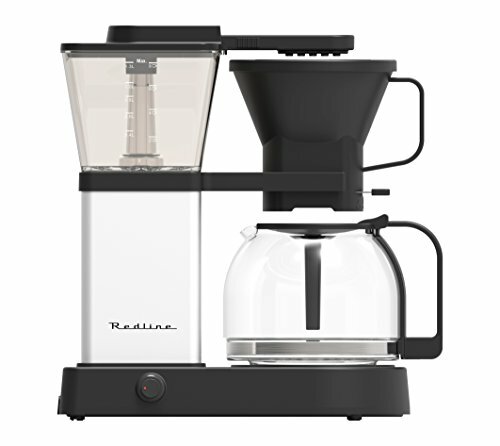 We believe the Redline MK1 Coffee Brewer should be a pleasure to use while also looking great on your counter. SATISFACTION GUARANTEED: We want you to enjoy the coffee made by the MK1 down to the very last drop, every time. That is why every Redline Coffee brewer includes a Limited 2 Year Warranty and 60 day return policy. If you have any questions about this product by Redline Coffee, contact us by completing and submitting the form below. If you are looking for a specif part number, please include it with your message.